Pai Gow poker is one of the most popular games at online casinos, live casinos as well as real casinos. Along with traditional Pai gow game with times new additions as side bets have been added to the game giving way for many Pai Gow variants to play right now. Here in this guide we will learn about the popular Pai Gow Poker variants, how they are played and where you can enjoy them. 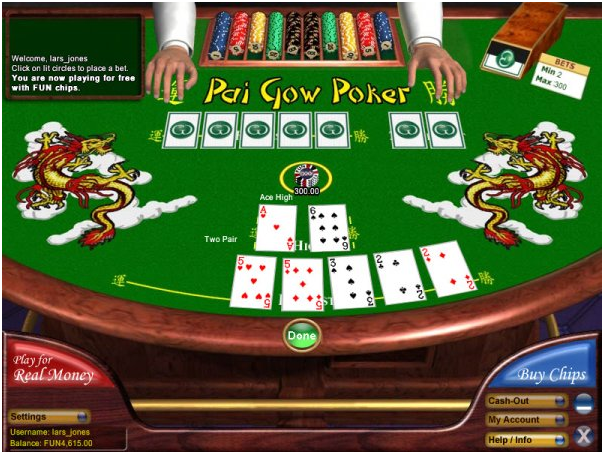 Note that these variants of Pai Gow come from many reputed gaming developers loaded with wonderful features of the game to enjoy on your PC, mobile or at land casinos in real time. 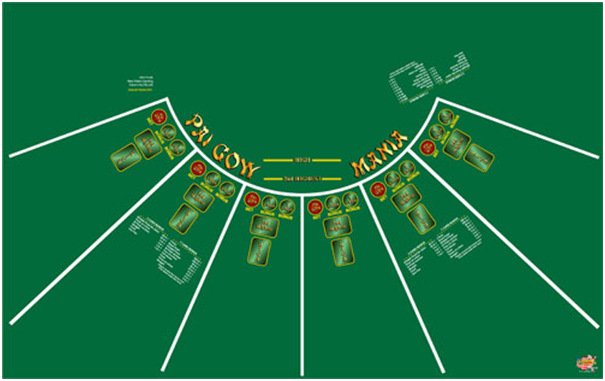 Pai Gow Mania was developed in early 2004. The first casinos carrying this game of Pai Gow were Fitzgeralds Casino in Las Vegas and Foxwoods Casino in Ledyard CT. This version of Pai Gow offered two side bets. The first was a side bet based on the first three cards dealt similar to 3 Card Poker’s “Pair Plus” betting option. The second option was based on the seven card hand similar to the bonus paid on the current version of Fortune Pai Gow’s Fortune bonus. This game failed to grow in popularity as it required the cards to be dealt by hand, so that first the three card bonus could be determined: both dealers and casino executives alike, were not too fond of this invention which made the already slow paced game of Pai Gow Poker even slower. The game still does, however, exist at Downtown Las Vegas Casino – Fitzgerald’s. Fortune Pai Gow poker was developed in 2004 as well and offers players an optional side-bet which pays out based on a player making trips/straight or better. This is the most popular version of Pai Gow with bonus bets to date. Another Fortune Pai Gow poker is a progressive game developed by Scientific games. 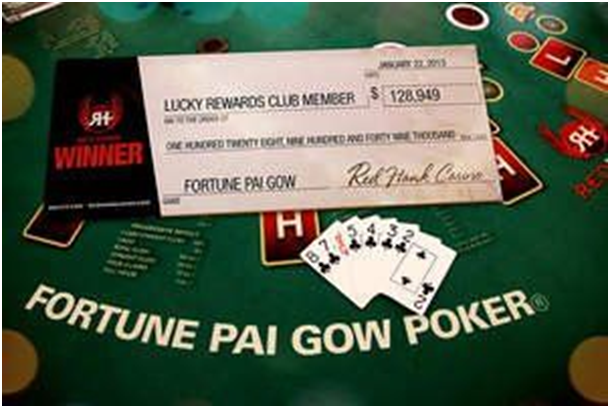 Fortune Pai Gow Poker Progressive adds a twist to Fortune Pai Gow Poker by giving players an opportunity to win all or part of a large growing jackpot. To begin each round, players make their standard Pai Gow wager and may also make the optional Fortune Pai Gow wager and the $1 progressive wager. Once all players have made their wagers, the dealer follows house procedures for Pai Gow Poker. While reconciling standard Pai Gow poker wagers, the dealer also reconciles bonus and progressive wagers. Players win the Fortune wager if their hand contains a four-of-a-kind or higher. Players who made a minimum Fortune wager of $5 are entitled to Envy bonuses if someone at the table has a premium hand. Only players who made the Fortune bonus wager can collect Envy bonuses. Players cannot win Envy bonuses on their hand or the dealer’s hand. Found at casinos powered by Bally technology this version of game is available both at land real casinos and online casinos. Commission-Free Fortune Pai Gow Poker features head-to-head play against the dealer and two exciting bonus bets. This is a commission-free game developed by Scientific games and is available at online casinos as well as real casinos to play. In the game players do not pay 5 percent commission when they beat the dealer; rather, when dealers play 9-high in their low hand, players automatically push. To begin each round, players make a standard pai gow wager. They may also make the Fortune Bonus and Dealer Bonus. Fortune Bonus bet wins if players best possible five-card hand is three-of-a-kind or better. If players wager at least $5 on the Fortune Bonus, the dealer will place an “envy” button next to their bet. This qualifies the player for a bonus payout when any other player at the table has at least a four-of-a-kind. Remember that players cannot envy the dealer’s hand or their own hand. The Dealer Bonus wager is based on the dealer’s 7-card hand. Players will only be paid for the single highest payout. 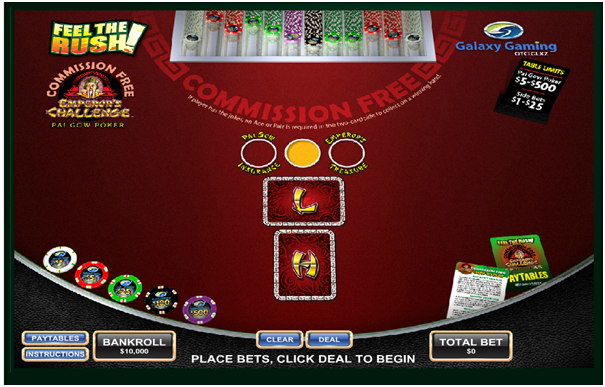 This Pai Gow variant came in 2006 and is another bonus game working much like Fortune Pai Gow; however, the pay table is different, as bonuses are also awarded for players making Pai Gow hands where hands with no pair, straight or flush. This game can be found in a handful of Las Vegas casinos including Hooters as well as a few Boyd Gaming casinos located downtown. 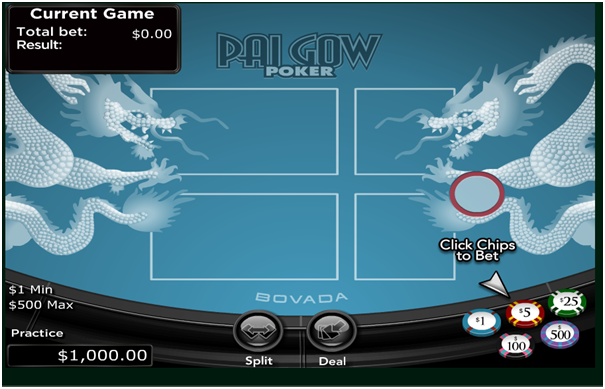 Also this Pai Gow variant is available free to play online as well as with real money at online casinos. Emperor’s Challenge Pai Gow Poker software by Galaxy Gaming is available at most of online casinos where you can take bets between the range of 5 and 500 with side bets between 1 and 25. This offers the player a range of flexibility to get the payouts they would like to achieve. The game is fun and requires that the player has minimum amount of experience and know-how in the poker table games world. The design is beautifully crafted and there was no background music playing, which was more than welcomed. Pai Gow Insurance was launched in 2008 and is a game where a bonus bet is offered on whether or not a non ranking Pai Gow hand is made. For example, a hand 9-high with no pairs, straight nor flush is worth a payout of 100 to 1, where an A-high hand with no pairs, straight nor flush is worth a payout of 3 to 1. Las Vegas casinos offering this game include: Red Rock, Aliante Station, Palace Station, Boulder Station, Texas Station and Sunset Station. You can find this Pai Go game variant at land casinos and few online casinos. There are differences between the way a dealer is forced to set their hand (house way) from casino to casino. House Way is a Pai Gow Poker term referring to the way “the house” is required to set their hand. Pai Gow players are often surprised to learn that the actual “house way” is different from casino to casino. In some cases these differences are not small either. The only thing of importance as far as House Way variant is to learn the rules of the casinos you often go to, and when visiting new casinos, ask and get further clarification when in doubt. At your local casino you can be the table watchdog, and there will never be a question about whether or not the dealer has set their hand correctly. At newly visited casinos, if you suspect the dealer might have played the hand against house way, then it’s always best to call the floor. For the most part, dealers always set hands based on the house way rules for their given casino; however, they’re human and with many 7-card hand combinations possible, mistakes do occur. In near all cases these mistakes are quickly resolved with a call to the floor. Now enjoy all these different variants of Pai Gow at Las Vegas Casinos or online casinos of your choice. ← Triple Bonus Pai Gow Poker- How to play at Four Winds Casino?